How much technology do you use to solve a problem? If you concur with the idea that the proper use of technology is the solution of problems, the next thing that might be useful is considering how much technology to use. It is never a case of no technology, only a case of how much? Do you wash clothes on a flat rock in a stream with a brush or with your bare hands? At the other end of the spectrum the question is, "How much intelligence does your watch need to have?" After all, once you have your pulse rate, text messages and emails coming in on your timepiece, do you really need streaming video? I spent most of my life building and using systems and tools that would let me do more things faster. It has only been the last few years that I have realized that the sheer joy of designing and fixing highly complex and unstable systems blinded me to the fact that many were a huge waste of time. There is a burden of self-training, and adjustment and repair time that needs to be considered when adopting new technology. There is also the possibility of hiring somebody who is more technical to adopt the technology for you and just produce the results you want. I recently came up with this rule of thumb: If learning how to setup and use a tool takes more than 15% of the time to complete a one-time project, it is not justified. If a tool like a software application used for many projects takes more than 5% of your working time to adjust and maintain, it is probably not worth fiddling with. Can you imagine driving a car that you had to spend several hours a week tinkering with? I used to have one of those, and it wasn’t worth it! 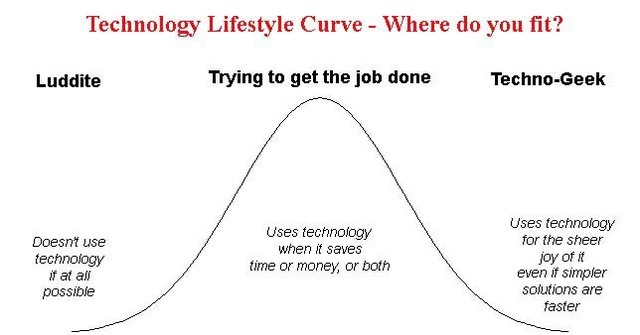 How do you choose how much technology you need for comfortable, stress-free living? When do you decide that you need to get personally involved in the technology versus having someone else do the heavy lifting? For example: Designing your own website or having someone else help you with it? Repairing your own car vs having the garage do it? Publishing your own books or letting a publisher do it? Do you do better with more technology at your fingertips or less? Share your thoughts with us. This entry was posted in Simpler Lifestyle and tagged Luddite, simpler lifestyle, techno-geek, technology decisions, using technology. Bookmark the permalink. 0 Responses to How much technology do you use to solve a problem? We spend so much time thinking how cool that it can be done, we never bother to think if it should be…..